This post will introduce the lightship I’m most closely connected with, which I’ve been consciously aware of over my house since early this year. 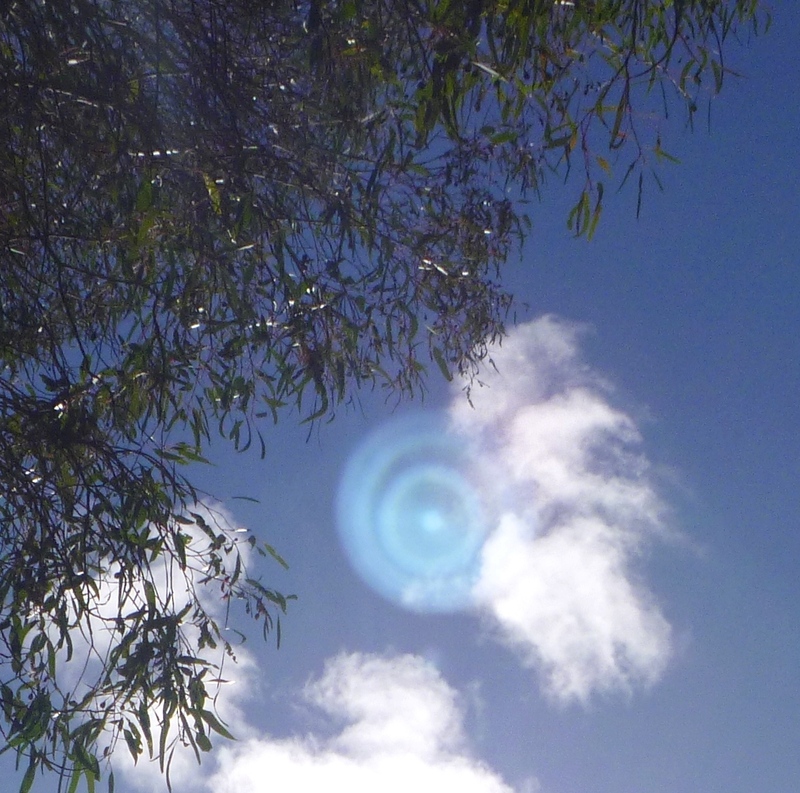 In photos, it presents as an orb-like disc of concentric blue-green rings of light. In higher dimensions, it appears as a large crystalline sphere of white light, with a central core of counter-rotating golden helix spirals around a purple crystal with a white light heart. This ship’s name is the Shem Arua, from the Arua language of the Leonine Beings, akin in Earth words to Samaria and Sumeria, which I’ll speak about below, since ancient Sumeria and its ‘gods’ have become the subject of many theories and speculations. I bilocate frequently onto the Shem Arua, a much loved sky-home to me, as it is imprinted with the soul energy of my Twin Flame, Ashura (and also with the soul energy of my Crystal Twin Soul, on Earth as Bareld Nijboer, and his Twin Flame, Tee’nah) – see this previous post). The Shem Arua is an extension of our combined energies, along with other friends on board, and has interacted at ‘ground level’ around my home in 5D frequencies. More about that and craft landings here in the next post. 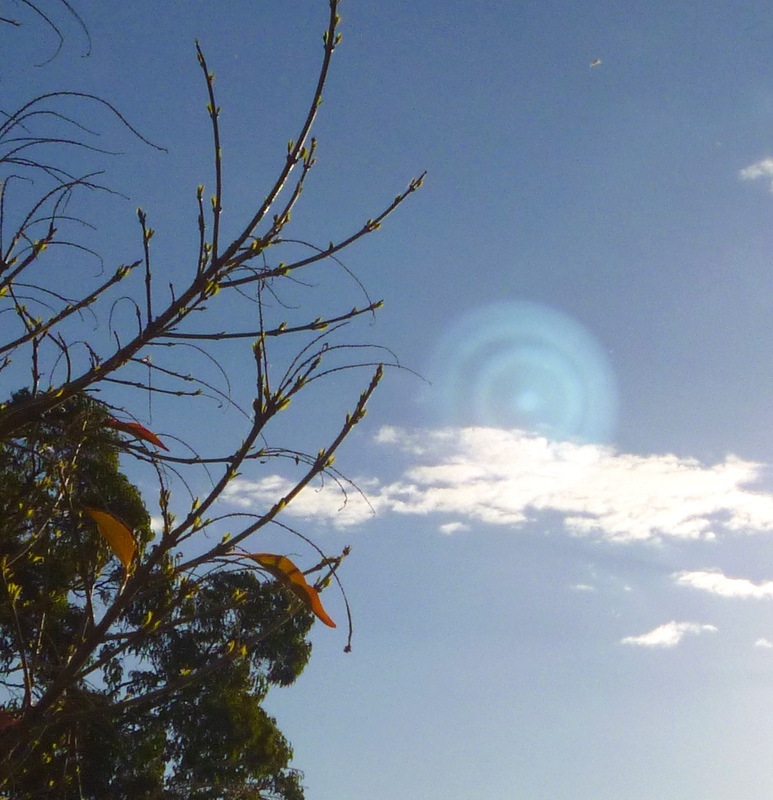 The Shem Arua first signalled its presence, ‘camouflaged’ as camera lens flare, in early March of this year. At that time, I understood it to represent activation of the pituitary chakra (which it does, as the opened pituitary chakra, aligned with the higher heart and pineal gland, makes a ‘trinity complex’ of higher frequency reception in heart-mind fusion) and lightships like this one and many others are broadcasting higher frequencies to the Trinity Consciousness we all have the potential to activate. 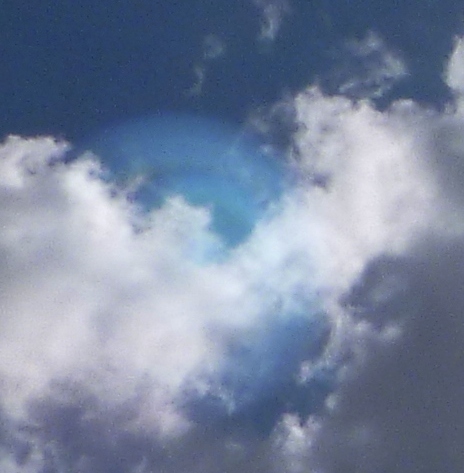 Ship appears as light refraction/lens artifact, symbolising the pituitary chakra, March 2014. The next time I felt the ship’s presence in May, and the focus of Ashura and others on board, I asked if they could show the Shem Arua in a clear and unmistakeable way. They then simply stationed the ship partially behind cloud cover, to show the ship as a spatial object (lens flare could only be in front of the clouds). 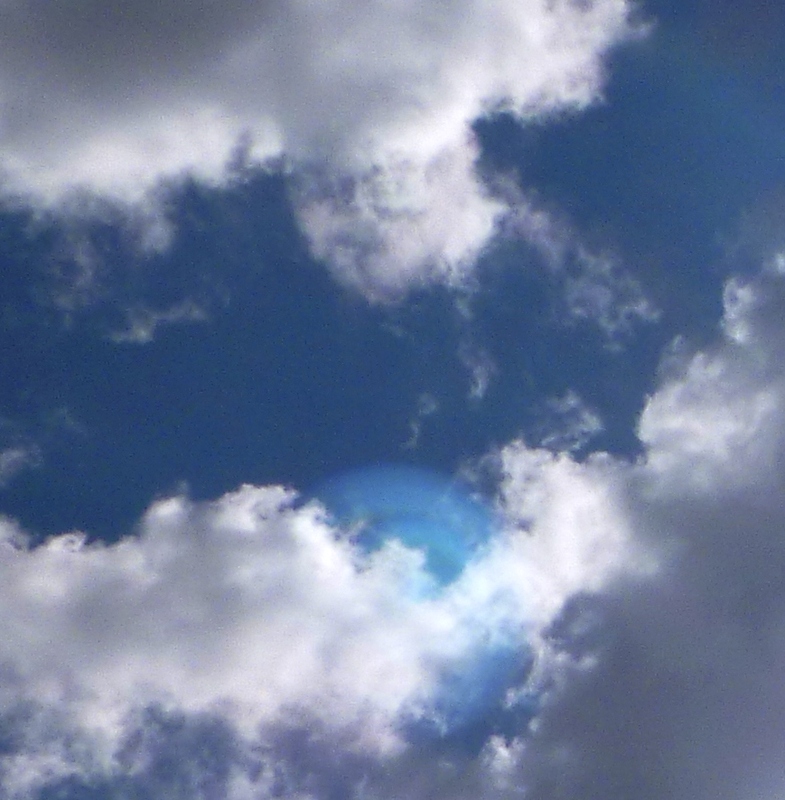 May 3, 2014, ship appears from behind clouds. 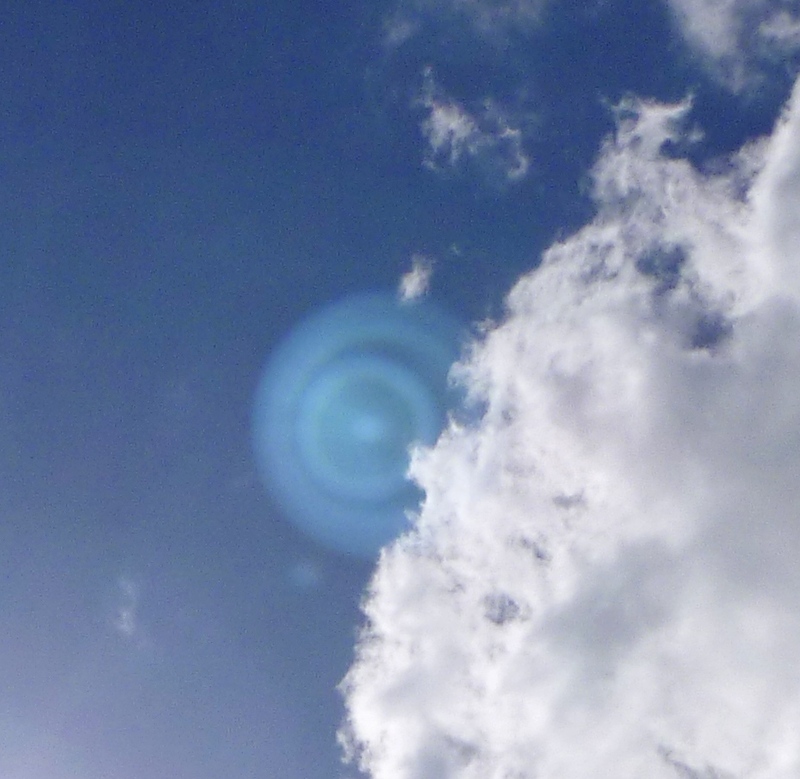 ‘Mastery of Time & Space is inherent in spirals.’ Photo May 11, 2014. For a brief period while the ship’s core was fused into a node (energetic channel at the crossing point of two ley lines: see the Gaia page) in the garden here to re-open the node’s blocked flow, I was walking-living-breathing in the reality of my 3D house and garden merged in with the 5D ship (a quite different experience to bilocation). The Shem Arua has a crew from many star nations, including Sirius, Lyra, Ursa Major and Procyon, along with visitors from other craft, Pleiadians, Orions, Andromedans, Alpha Centaurians etc. Ashura defines the meaning of Arnap, the name of his 5D soul aspect on board ship, as ‘One who steers (through) the Bow’ (Arrow of Source, the divine masculine principle & energy). We were incarnate on Earth together some 150 000-120 000 years ago. Ashura is remembered as the Assyrian ‘sun god’ Ashur, depicted with Bow and Arrow (with a Lily head, symbol of immaculate conception) amid sun rays or winged solar disc, protecting the Asherah Tree, the Mother aspect of Source. The feminine aspect, Asherah, was later suppressed by the Ashur priesthood, long after we were gone and the masculine-feminine balance on Earth distorted. 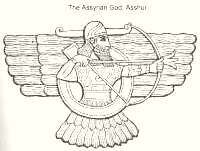 Ashur with the Bow and Lily Arrow of immaculate conception; from Heaven, he fertilizes the feminine bow/arch, and the Asherah Tree of Source blooms. Mythologically, Asherah was the consort of Anu and El, father gods of the Sumerian and Uggaric pantheons respectively. An/Anu means ‘the heavens’, El/Il/Al means ‘god’ or ‘divine light’; many angelic names have the suffix El…Michael, Gabriel, Raphael etc, as creator beings with attributes of El. The Samarian and Sumerian areas were settled by star people – leonine beings and angelic beings – long before the Sons of Anak (conflictual Anunnaki) arrived, and those older beings are remembered as the feline ‘gods and goddesses’ – beings from Sirius, Lyra, Antares, and as the Angels (Ahura in the Zoroastrian texts). Higher dimensional beings also came from Venus to that area, also to Central/South America and Australia, and their energy and presence is also woven into the long ago prehistory of Sumeria, Elam, Assyria, Egypt and surrounding areas. Channelled (dis)information and evidence from the ancient world – tablets, texts, images – have been interpreted with varying degrees of intent and accuracy. The only person I’m aware of speaking openly of the Anunnaki from first-hand contact at the current time is James Gilliland of ECETI. He talks in interviews like this one about the return of the benevolent Anunnaki (ETs) and the cooperative effort of many star nations, including the Arcturians, Sirians and Pleiadians, to release Earth from the grip of later waves of control-oriented beings grouped under the umbrella term Anunnaki (fallen angels/archons, reptilian groups, mantids and greys). 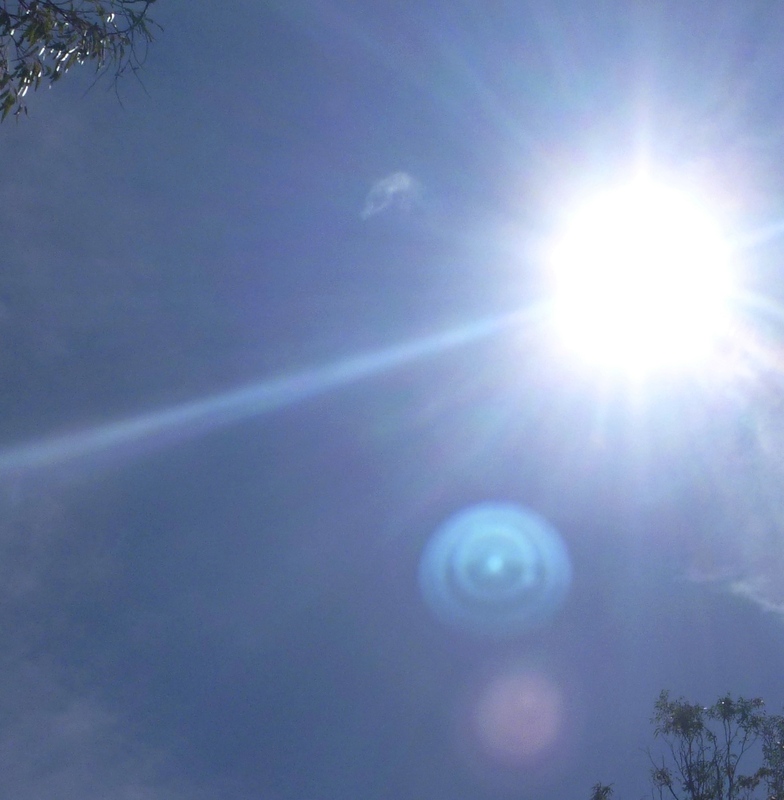 The undertaking of the higher Light Beings – the removal of degenerate entities and their mind/energy controlling technologies – is directly assisting humanity to recover their Inner Truth and the renewal of love for all living beings on this planet, through a series of waves of divine Light bathing the solar system and triggering a Shift in planetary consciousness. This Shift isn’t exactly a walk in the park. However, the incoming wave, steered by Love, the will of Source, is continuously building, until a point will be reached where the old 3D template of duality, hierarchy and separation is no longer a viable projected reality option, and the new 5D+ unified loving reality can blossom. Focusing ourselves in this knowing keeps us moving in harmony with the Shift Wave, and helps us actualize our individual and collective New through our own unique yet shared viewing points and experience. This is an individual effort and a deeply collective one, unified at the highest frequencies, unifying across all frequencies. The collective effort includes those ‘on the ground’, Inner Earth beings, Gaia and her subtle realms, and our star family of the Ashtar Command and Intergalactic Confederation who are showing themselves here as ‘lights in the sky’ until enough frequency convergence is reached for them to reveal themselves openly and connect with Earth humans on the ground. Last week, aboard the Shem Arua, I was given a device to hold, a wave form modulator, and holding it, felt into the existence of everything as a wave form – light, sound, time, the elements, all thoughts and emotions, apparent ‘solid’ dense matter as simultaneous wave and particle. As I held this device, and felt its relationship to the Shem Arua, the ship’s appearance in 3D photos became clear. The concentric light-rings describe the Shem Arua‘s function as a giant wave form modulator. Feel the light of those rings or spirals rippling out, along with countless ships, working now with the Source Wave to help shift the wave form of life on Earth to a higher frequency. All in flow with the pace and attributes of the increasing Light. The sound units of the languages of Lion Beings, Angels and Carians/High Dragons are embedded in the roots of humanity’s languages. Shem Arua means ‘Light of the Lion’ (literally Light I-Lion-i). In the ancient world, Samaria (land of the Samaritans), Sam-ari-a (light-lion-i), was under the protection of the Archangel Ariel, whose name Ari-El, means Lion of God. Returning to Arnap, you can see the Lion prefix in his name also. He merges the energy of the Lion and the Bow, Archer of the Asherah. 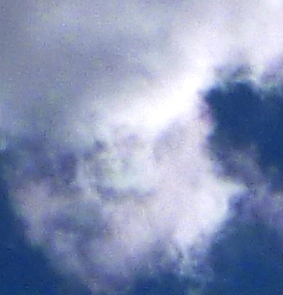 In the photo below, his face is visible under a bow/crescent of white light, in the cloud above the Shem Arua. 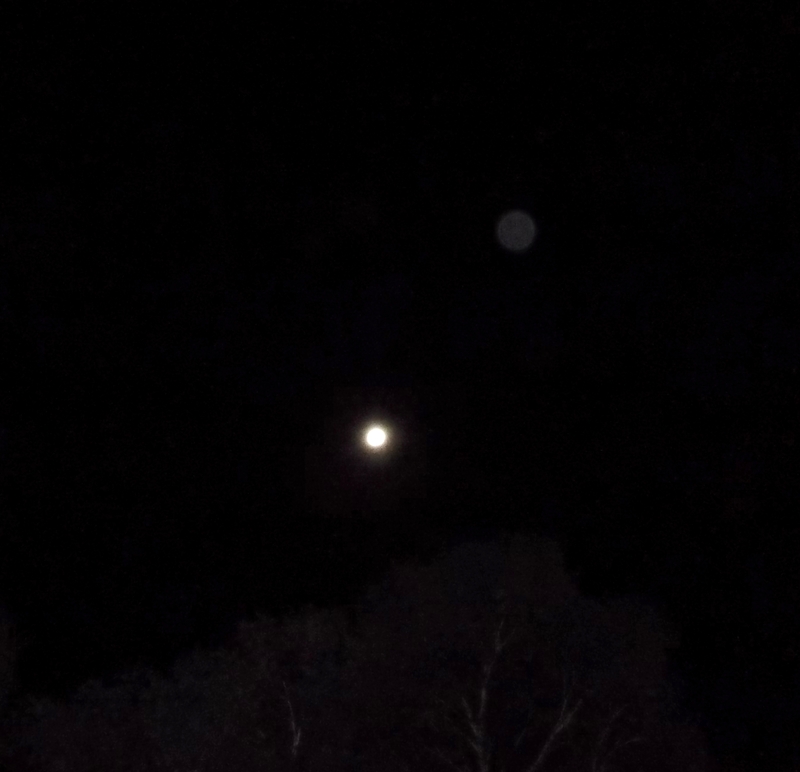 I’ll end the first part of this post with a night-time shot of the Shem Arua, in orb-like form, upper right of the Moon. The Shem Arua and Moon, August 8, 2014. 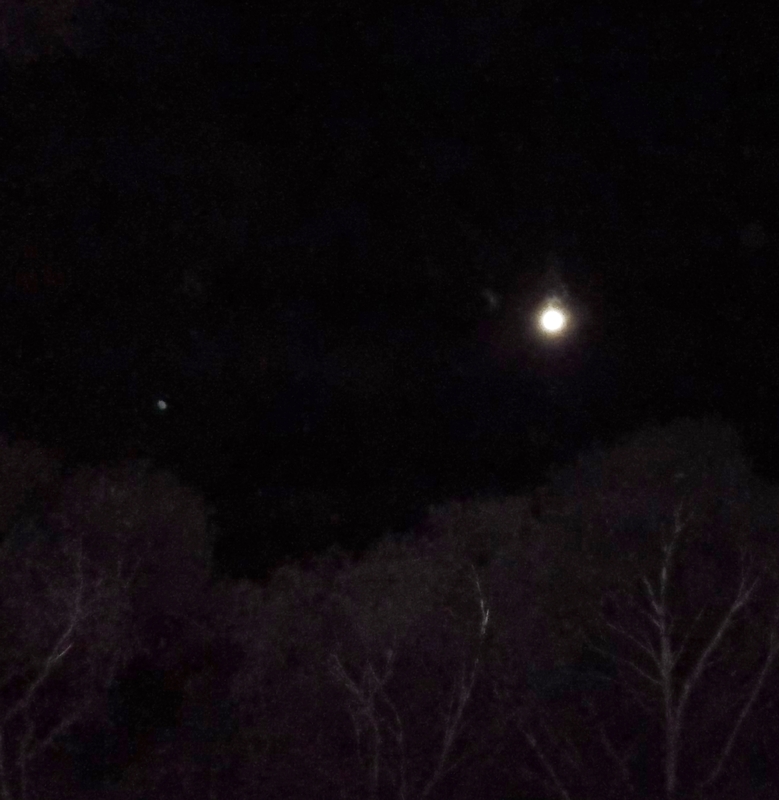 The light just above the trees on the left of the photo below is Ashura’s small ‘pod craft’, which I’ll speak of in the next post. Ashura’s pod ship, left of Moon, August 8, 2014. The Cubed systems of the Darthu energies (among which Sirius and Procyon are inserted, but it contains more systems) had a DNA influence in the eventual Anak race. The origin of their DNA lie in the Arcturian realm, like Ashtar’s origin. About the Light language, Arua. Ru is Lion of Creation, and to be more in effect, the sound wave rrrrrrrr, even in ultra sound (like cats have), or not, means the Lion sound. The U as a Bow is the Unified Creation sound as in Nu or Hu. These all are Universal sounds and waves of Light. Arua itself means this: I (Higher Self) Lion i (lower self) , the Whole Unified me. Shem means Light. Nua means we, with a capital N…where Nu represents the Unified Creational energy force(s), of the I, the small a. Nu alone means it is a part the Creational force of Source. Anua means Gate(way)…or Door(way). You see here a small(er) creational force at work, like a kind of portal, a nu energy…Light language can be shifted, reARranged and singled into letters. Kind of what happened with hieroglyphs going into the Phoenician alphabet, then into Greek alphabet. By the way…Rua means language…just another block or shift of the word… Even by shifting one letter of the word Arua, the Light and Sound of the energy shifts and becomes a new meaning and energy. It all goes much deeper. *The second part of Lights in the Sky can be read here. This entry was posted in Angels, Arcturians, Arnap/Ashura, Ascension, Ashtar, Ashtar Command, Chakras, Dimensions, Intergalactic Confederation, Lightships, Lyrans, Pleiadians and tagged aliens, angels, Anu, anunnaki, archons, Arcturians, Asherah, Bareld Nijboer, bilocation, contactee, ETs, fifth dimension, Galactic Federation, galactics, gods, greys, James Gilliland, leonine beings, Lyrans, Pleiadians, Procyon, reptilians, Samaria, Sirians, star people, Sumeria, UFOs by Joanna. Bookmark the permalink. I just stumbled across your page. I am so happy I did. I’m very new in my understanding of my spirituality. I have grown a lot over the years but no where close to what I feel I should be. I’m well aware of the galactic command but I am writing in regards to the “UFO” that is around my home quite frequently. I noticed it instantly when I first saw it and knew exactly what is was. I felt very excited, nervous, felt like it was there for me(doubting that though) I showed 11 of my family and friends who never believed until that night. We watched it for hours. My sister in law has many pictures of it (I still need to get them from her). It looked exactly like the last picture on this post. I have since seen this ship about 6 times. Always appears in the same area and I always have a peaceful feeling and warmness in my heart when it’s around. Is their anything I should do? Try to contact it? Let it be? In answer to your questions about contacting it or letting it be, it seems to me that ‘contact’ is already happening, and these are close beings to you, to keep appearing so many times. There will be a message, I feel, in terms of where they are appearing, since it is always in the same spot, so feel into what that signifies to you. My experience of star family would say, let it unfold in the ‘right pace’ for you. You have only to ask, in your heart, for communication with your galactic family and friends of Love, in alignment with your highest good, in alignment with Source. If your heart is open, and your mind is still and relaxed, contact will flow through in exactly the right way for you, and in accordance with your soul purpose here. 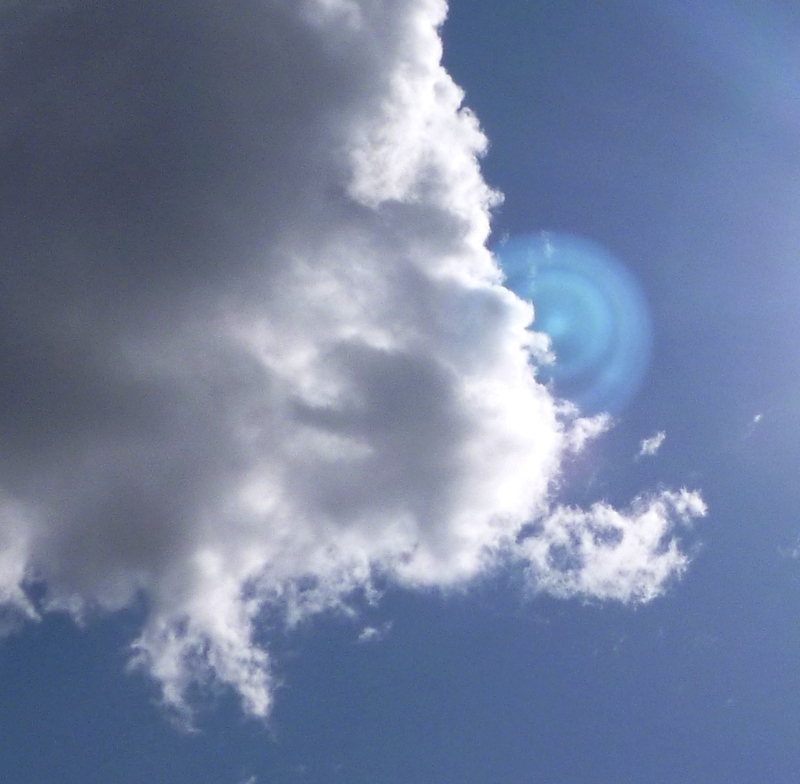 What you’ve written about the weather and manifestation is totally in sync for me, as I’m now writing Part 4 of Lights in the Sky, and it is all about weather, star family, and co-creating with Love. Will post soon…. Lol, yes I do ‘get’ what you have said about ‘coping’ with receiving/allowing ALL…and it’s one of the reasons why ‘ascension’ is a step by step process for Earth humanity. We’ve been in ‘limitation programming’ (including self-limiting) for so long, it is very conditioned into our human selves…so for most, it tends to be a gradual opening and relaxing, that gets deeper and wider as we persevere with our focus and loving intent. We are literally rewriting our programmes, and teaching ourselves how to relax, trust, allow, align, receive and give/act, as One with Source’s flow…..what a journey, eh? With shifts and changes we feel to make, on any level including physical, like changing our diet, I would simply say, be at peace with your process. Ask yourself, what is the ‘expectation’ you have, that makes ‘going full vegan’ feel like a problem? Feel deeply into what is motivating you there; is it only from Love, or is there perhaps some subconscious fear-base still at work as well? If your body is craving something on a physical level that doesn’t ‘sing in your heart’, then ask what the root reason for that craving/perceived need is…and ask your body’s inner wisdom – it’s guidance system – what would help it to balance. Trust it. You may surprise yourself! I certainly have, plenty of times.